Demonetisation and Donald Trump as US president in November provided awesome investment opportunities. I did invest in Ashok Leyland and as planned did profit booking in L&T. The short term impact of demonetisation’s will prevail in the first half of 2017 and how events pan out is yet to be seen. Donald Trump victory can mean US markets will factor in growth which may lead to profit booking in emerging market and funds flowing back to US market. With growth forecast in the US, FED rate hikes can lead to more profit booking by FIIs in the emerging market and in India. Too many triggers for the market to remain sluggish can be once in a lifetime opportunity to build a long-term investment portfolio in 2017. I have invested 30k in November (Transaction details here) and will keep investing as planned of 30k per month in the ELSS. As always I select the dividend option so I get full tax saving benefit and get back dividend that I can deploy in stocks. Pidilite was a safe bet in my portfolio. Ironically it is the top loser now. There are many reasons for it to be a top loser but I am confident it will recover soon. A recent investment that has significant weight on my portfolio and it is one of those sectors that may have after effect of demonetization. The biggest lesson learned holding Pidilite is, always keep room to invest more in corrections. The amount invested in this stock was under 25k which is quite low compared to other stocks. It had run-up from my purchase price and I was not very comfortable adding more position at elevated levels. Made no sense in holding this stock in my portfolio if I could not add more quantity. L&T is a CapEx business and deals with cash (not black money) like paying wages. In fact, all infrastructure companies pay wages in cash and they can have issues with the demonetization after effect. Though I am not very sure how this will impact in totality but, as my position was very small it made sense to book profits. Last but by no means the least, I sensed better opportunity in the auto sector. I sense auto sector will be the market leader to lead the next bull run in the coming few years. In the short run, demonetization will have an impact on the auto industry and in my opinion, this is the best time for investment in the auto sector. Smartphones made disruptive changes to the telecom industry and companies like Nokia and Blackberry could not keep up the pace with it. I see similar things happening in the auto sector very soon. Indian auto sector never moved from a liquid (petrol and diesel) to gas based fuels but I am sure it will adopt electric vehicles very early due to benefits in pollution control and cost effectiveness. Electric cars will eventually weed out diesel, petrol and even CNG vehicles and companies investing in R&D of electric vehicles will have an early mover advantage. Maruti was available at such a mouth watering level that I was not able to decide on Ashok Leyland. I was in double mind to buy Maruti at 4,850 or Ashok Leyland at 78 and the day Maruti ran up past 5,000, I took a call on Ashok Leyland. I follow my fundamental analysis principles for investing in any stock and Ashok Leyland is no different. Truck manufacturer cannot ba unique player but they are the largest provider of trucks to the Indian army. In the current scenario (Surgical strikes), defense is a priority for India which can be positive for the company. There are no government policies that control the profits of such business. Simple business which is to have variety of light commercial vehicles for growing India’s need. The company has its operations for decades and don’t see any loss-making year in the past decade. The company has good dividend history and in last decade they only missed dividend in 2014. Ashok Leyland is part of the Hinduja group which is very experienced management. There is some debt in the company but the debt equity ratio is well under 0.5 and it is going down every year. They have introduced electric bus and this is just the beginning of electric vehicles in India. Have tie ups with Nissan motors on many front and have even acquired light commercial vehicle division of Nissan motors. Have good sales growth, good ROCE, growing EPS, never made a loss and is available at 20PE. Promoter stake is above 50% in the company. Still there are couple of points to consider. multiple of 20+ and 4.5+ times its book value. The company has delivered really bad numbers in 2014. Hinduja brothers’ named surfaced in Bofors scandal but were cleared of all charges in 2005. In March 2015, 70+ was a resistance for the stock and in the current correction of 110ish, it has bounced twice from 72 (top blue line) which will act as an intermediate support. The best buying range will eventually be between 64 and 72 and with so much negative news waiting for the auto sector, I think it can slide down in between the blue lines. Once it slides below 72 and touches 64, will accumulate more once I see 64 as bottom being tested and not breached. I have added 1000 shares of Ashok Leyland to my portfolio at Rs 79.15. Contract notes here. 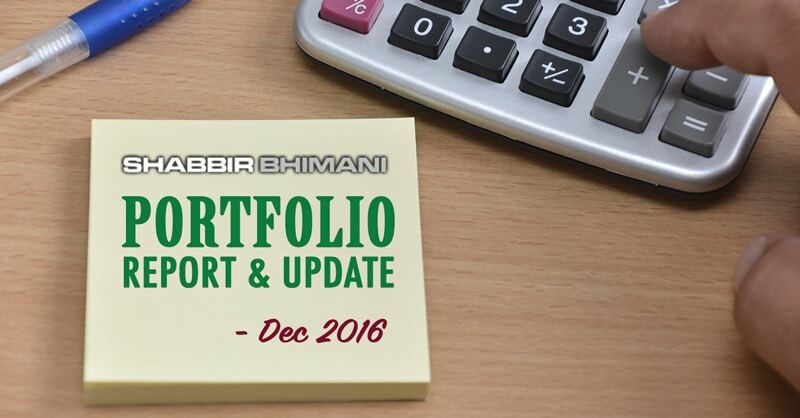 Stocks I am holding in my portfolio along with the link to why I have invested in them. I would like to keep cash ready to be deployed in Ashok Leyland as and when I get an opportunity in the midst of low November sales volume numbers of Maruti, Hero Moto or even bad November GDP number. Apart from Ashok Leyland, I will continue investing in my DSPBR ELSS fund as planned.